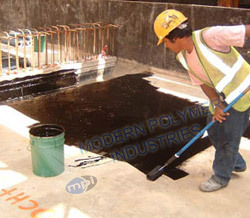 List among the top firms we also offer Bitumen premier it is manufactured using bitumen solution which is used for sealing of prime porous and non-porous surface, and also to protect residential and commercial building. Bitumen Primer is used to protect substrate against corrosive attack, is suggested to apply anti-corrosive primer.It is best for protection against sub-striate against atmospheric corrosion and chemical corrosion. It is a mixed substance made up of organic liquids that are highly sticky, water proof, viscous,acid proof as with all surface coating, good Bitumen Premier is used for long life of the system. it is applied by brush or roller and allowed to dry before any water proofing treatment so to avoid solvent it is used in defects such as cracks, broken mortar joints, etc. are to be repaired prior to Bitumen primer application. Bitumen Primer is used for all type surface of tank, pipes, girders, marine structure either interior, exterior steel, concrete or wood and require protection against corrosive area, and also to protect against corrosive attack followed by finish coats, screed lining, brick ,tiles lining and also used for chemical corrosion .